Students pursuing Higher Education at Following Reputed Universities in the US. 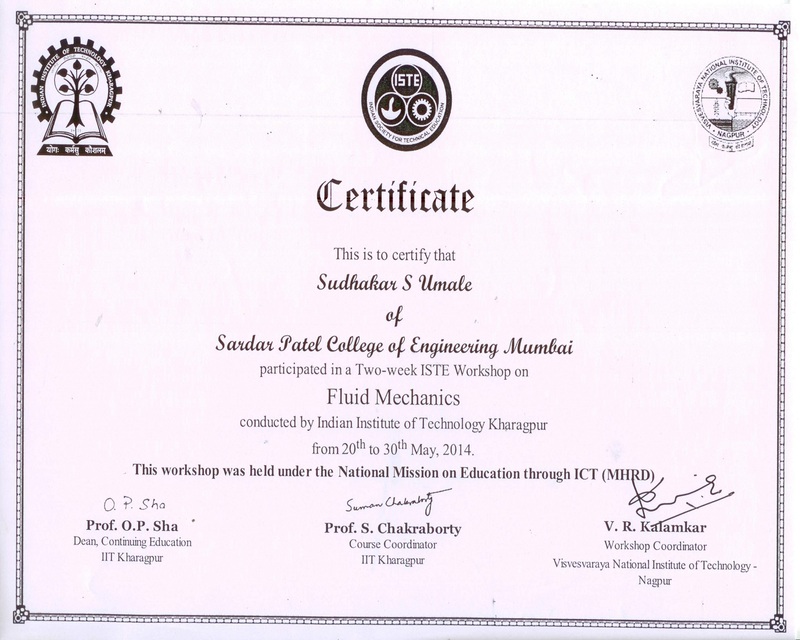 Pursuing M. Tech at IITB. Robocon( short for Robotics Contest) is organized by Asia-Pacific Broadcasting Union, a collection of over 20 countries of Asia Pacific region. NHK, Japan had already been organizing such contests at national level and also became the host of the first ABU-Roboconin 2002. Since then, every year one of the member broadcasters hosts this international event. The broadcasters of each participant country are responsible for conduct of their national contests to select the team which will represent their country in the International contest. Teams from engineering and technological colleges are eligible for participation. Participating teams are expected to design and fabricate their own robots and organize their teams including an instructor, team leader, manual robot operator and an automatic robot operator.
" SPCE TEAM STOOD 5TH AMONG 271 COLLEGE IN THE VIRTUAL EVENT OF SUPRA COMPETITION ORGANIZED IN THE YEAR 2013 "
Thermal Engineering Students Association (TESA-SPCE), an academic forum of students of Mechanical Engineering Department, SPCE, was incepted on 30/10/2017 at SPCE Seminar Hall. Vision and Mission of TESA-SPCE is constant involvement of students, through participation and practice, in exploration of knowledge of Mechanical Engineering and allied multidisciplinary domains. 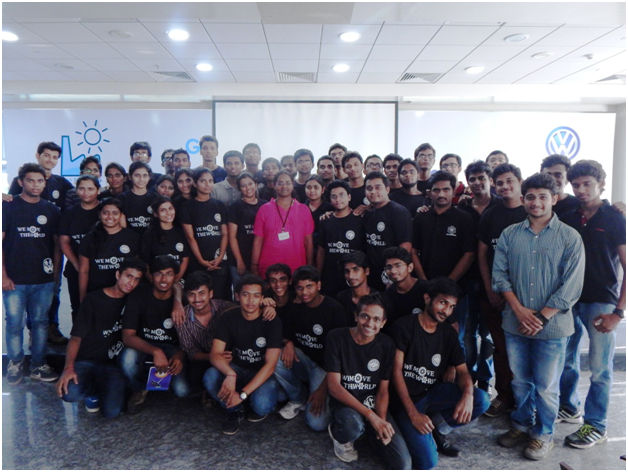 Prof. U.N.Gaitonde, Department of Mechanical Engineering, IIT Bombay graced this occasion with his key note address and valuable guidance to our students followed by an interactive session with them. Prof.Dr.N.R.Raykar, HoD (Mechanical), Prof. Dr.R.B.Buktar, Dean (Academics) and Prof.Parag Muley, Faculty Advisor,TESA-SPCE also extended their guidance to the gathering of students on this occasion. The Inaugural function was made successful by the Gracious presence of our chief guest Dr. Abhay Wagh, Dy. 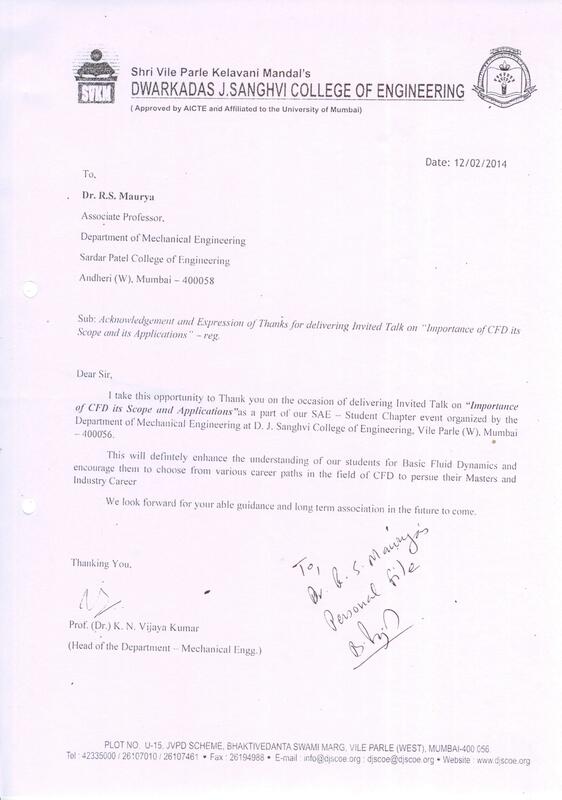 Secretary, Ministry of Higher and Technical Education, Govt of Maharashtra & the Guest of Honour Dr. J.V.N. Rao, former Principal of SPCE. 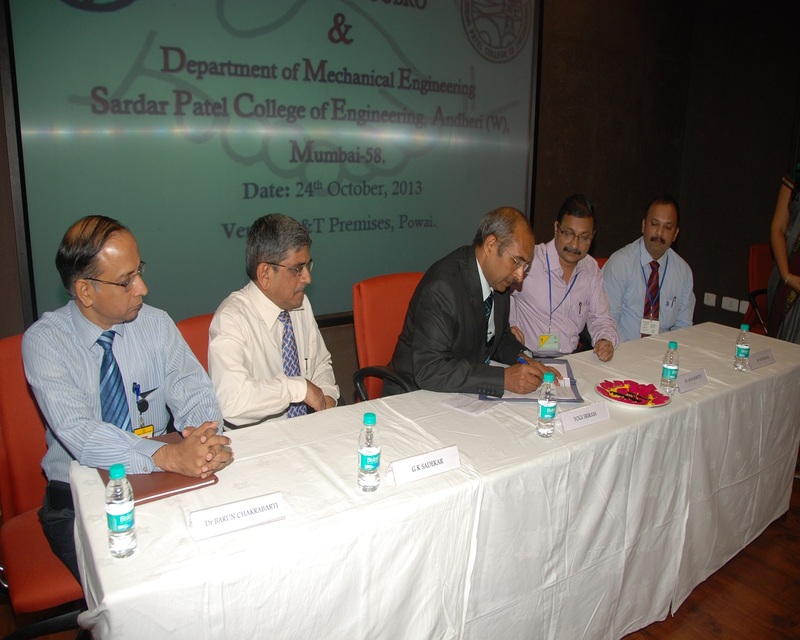 The Key Note addresses were given by Prof. S. L. Dhingra (IITB Mumbai) & Prof. M. C. Deo (IITB Mumbai). 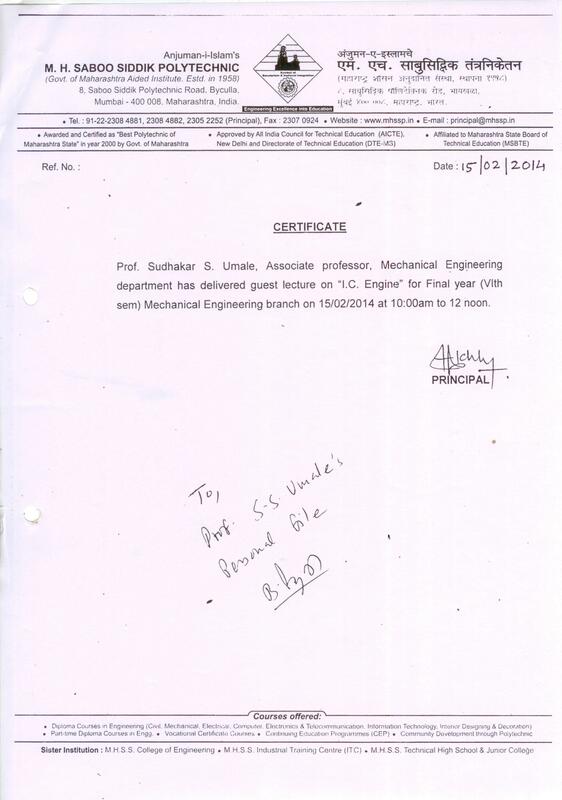 In Mechanical Engineering Stream, Key Note address was given by Dr. B.M. Dabade, Director, SGGSIET, Nanded. 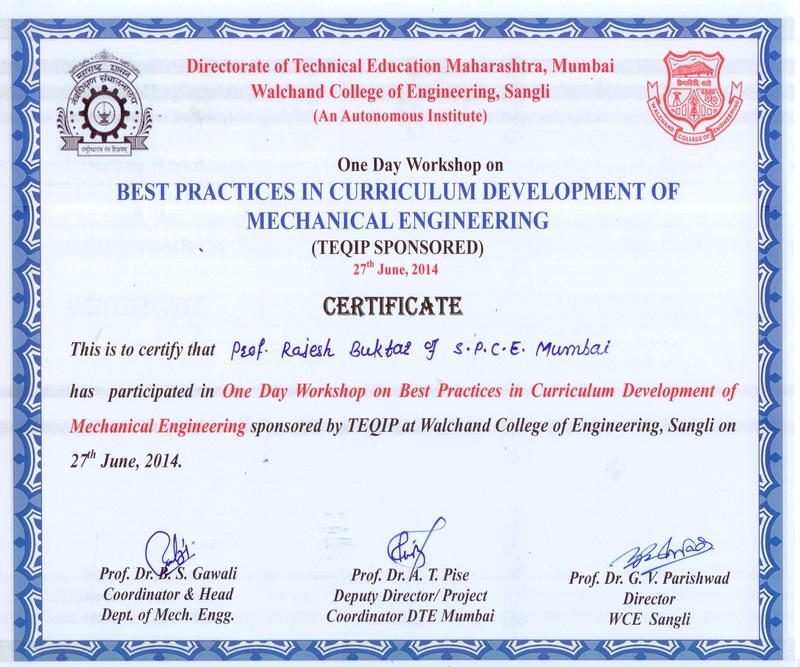 Total 127 papers were received in the Mechanical section and 58 were selected for the presentation. 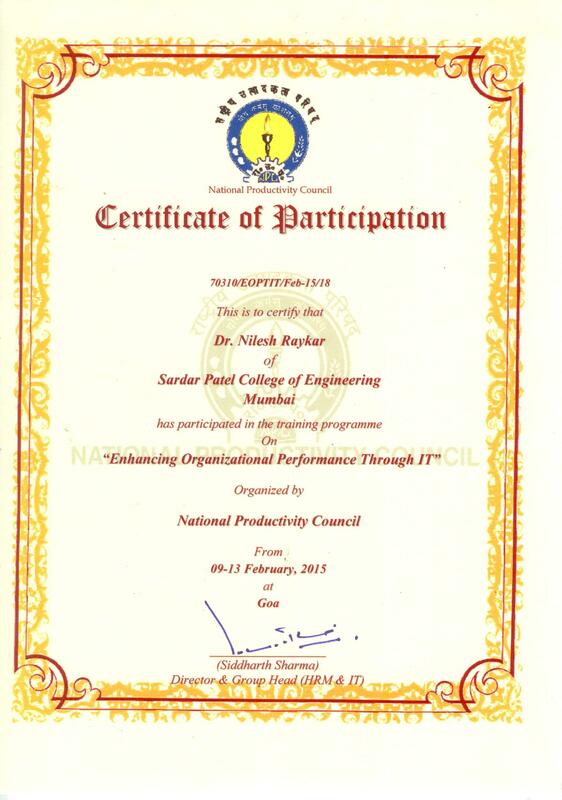 Total 73 participants were registered. 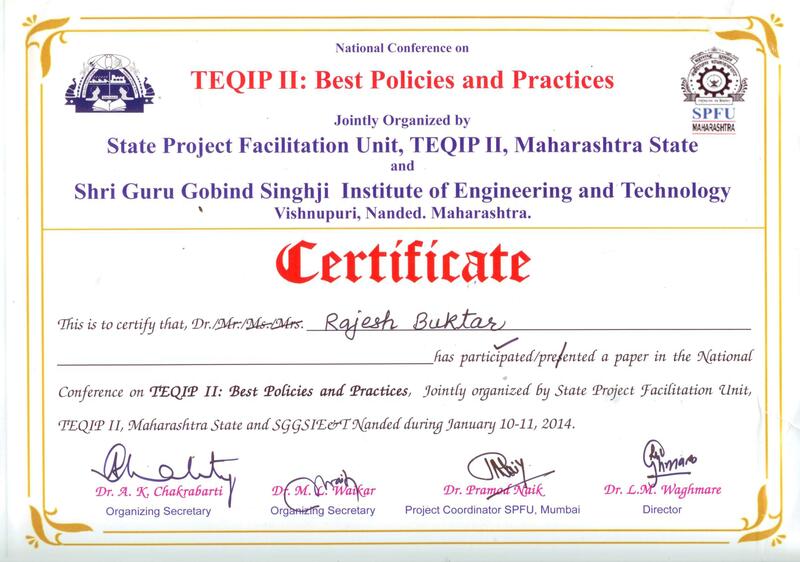 In the Civil engineering section 101 papers were presented. 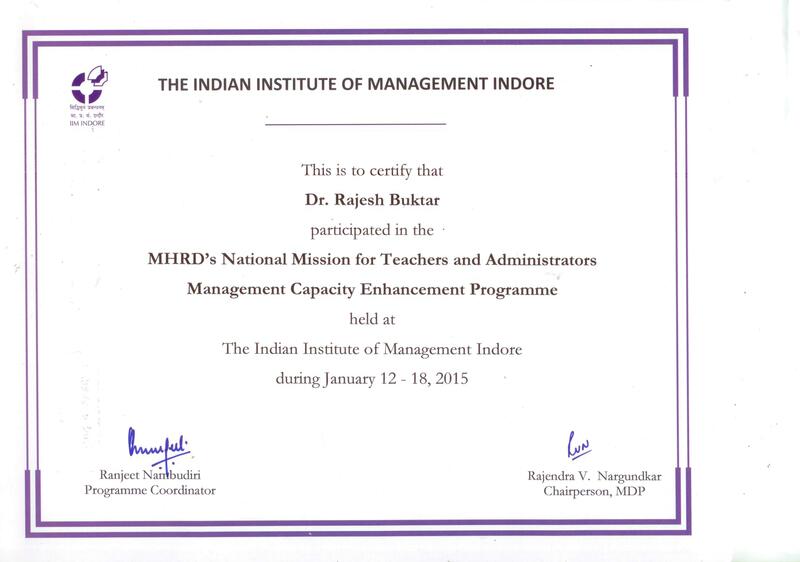 The valedictory function was made successful by the gracious presence of our Chief Guest Dr. R.P. 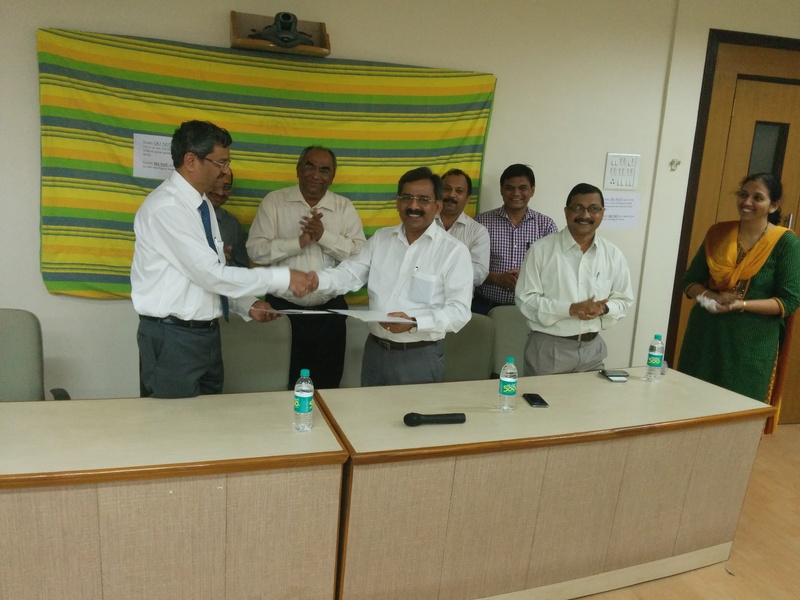 Mohanty, Vice Chancellor, SOA University, Orissa and the Guest of Honor Dr. S.S. Mantha, Chairman, AICTE ,New Delhi. The Conference coordinators Dr. A.R. Kambekar from Civil Engg. Department and Dr. S.B. 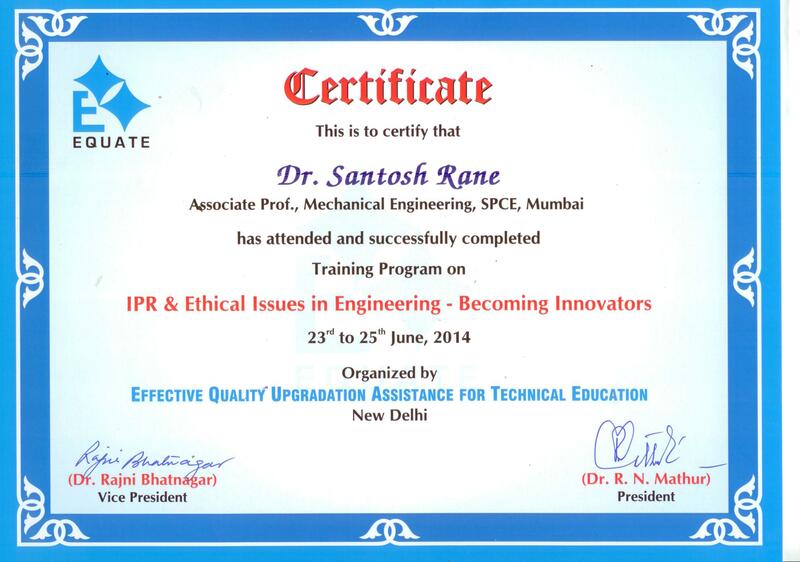 Rane from Mechanical Engg. Department thank sincerely to all, who helped directly and indirectly in organizing this conference and making it as a successful event. 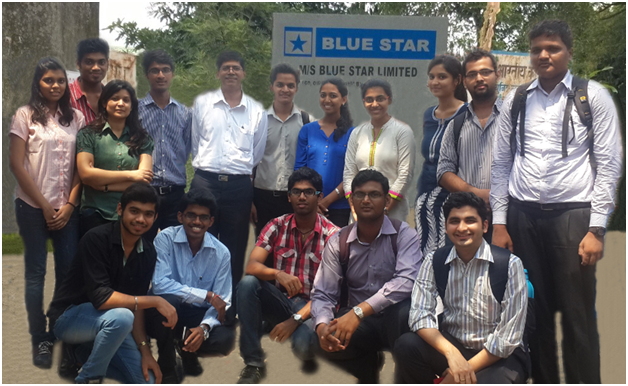 9 SPSS Software Training SPSS, South Asia Pvt. Ltd. 22/06/2015 To 24/06/2015 U.G. , P.G. & Ph.D. Following is the list of students who have secured admission for M.S. in Foreign Universities for the year 2014. 1 Jovin D'Sa University of Michigan,USA M.S. 2 Shruti Sane Columbia University,USA M.S. 3 Ajinkya Karpe University of Florida,USA M.S. 4 Gupta Kunal University of Florida,USA M.S. 5 Tanvy Limaye Northwestern University,USA M.S. 6 Umang Bohra Northeastern University,USA M.S. 7 Neha Deshmukh North Carolina State University,USA M.S. 8 Aishwarya Soparkar New York University,USA M.S. 9 Smeet Patel University of Texas,USA M.S. 11 Palak Shah Binghamtom University,USA M.S. 12 Chaitanya Kadakia Arizona State University,USA M.S. Following is the list of students who have secured admission for M.S. in Foreign Universities for the year 2013. 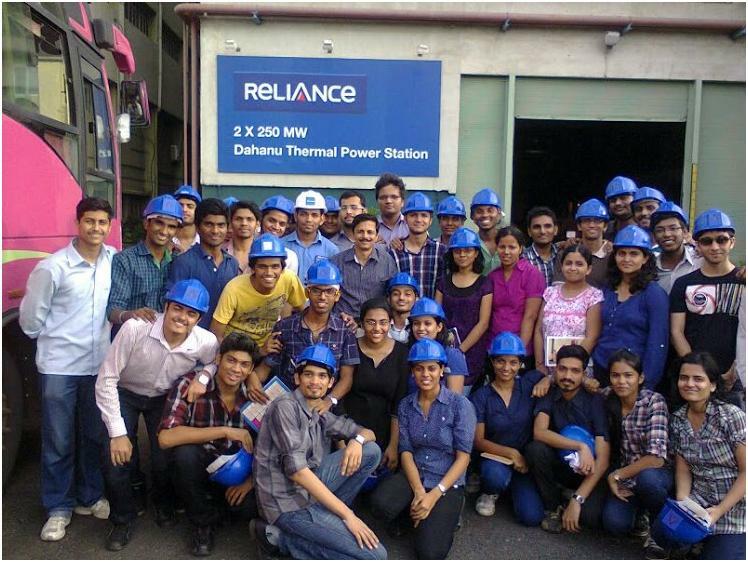 1 Emerson Climate Technologies, Pune 07-07-2015 Industrial Visit, Internship Training etc. 13 YARDI PRABHU CONSULTANTS & VALUERS PVT. LTD. (YPCVL) 21st May 2009 Providing professional training & consultancy. 14 TECHNOPHILIA SOLUTIONS Kandivali (E),MUMBAI 12th August 2008 Supporting development issues of both the organizations. 15 DFX SYSTEMS DADAR, MUMBAI 10th August 2007 Exchange of expertise of both the organizations. 16 TECHINT HYPERTHERM PVT. LTD. Supporting development issues of both the organizations. 17 BENTLEY SYSTEMS INDIA PVT. 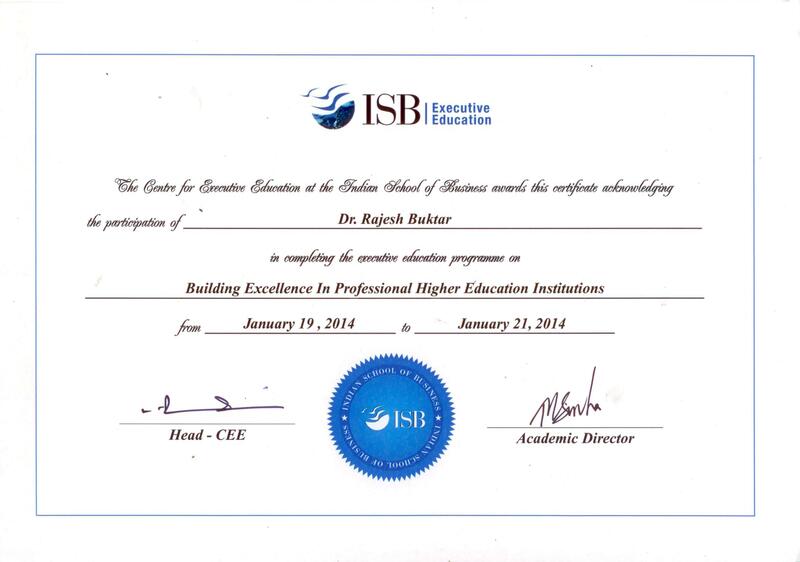 LTD. 14th December 2004 Involvement of expertise form industry into the making of curriculum. 18 CONTEC AIRFLOW PVT. 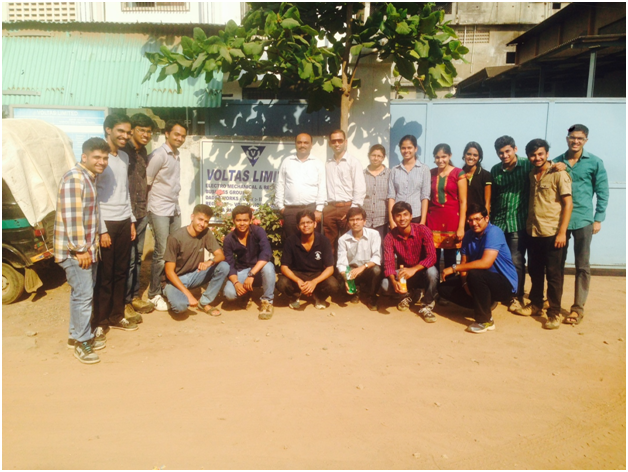 LTD. ANDHERI(E) 28th October 2004 Arranging industrial visits and sharing knowhow. 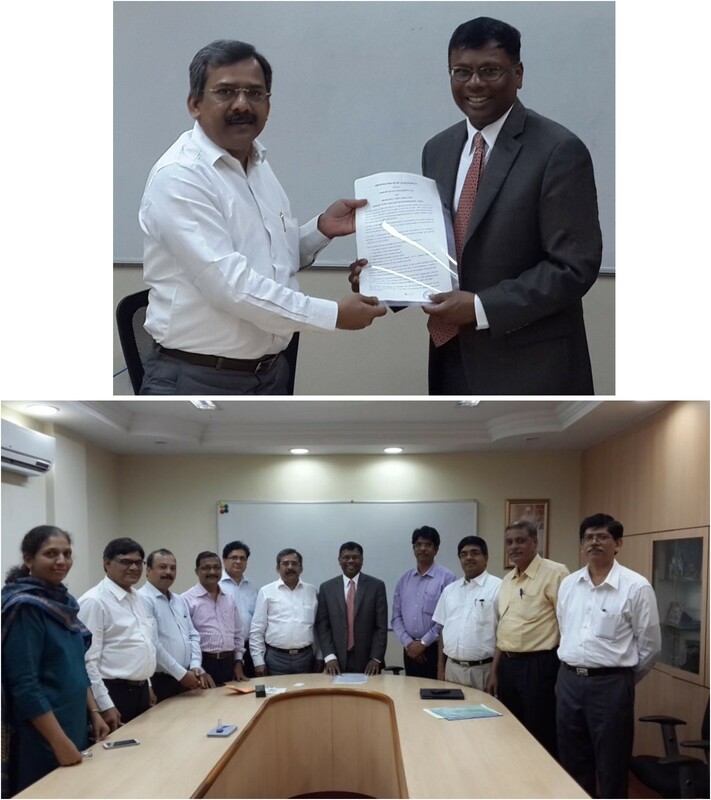 19 MAHARASHTRA KNOWLEDGE CORPORATION LIMITED (MKCL) 8th June 2004 Conducting MS-CIT courses under the overall coordination & management of MKCL. 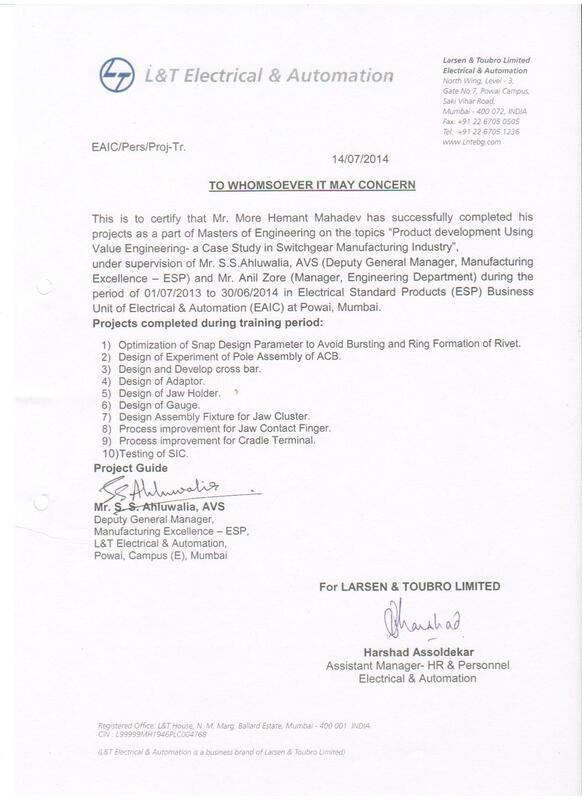 20 VAS Technologies Pune 15th March 2004 Conducting Certificate Courses in CAD/CAM/CAE. 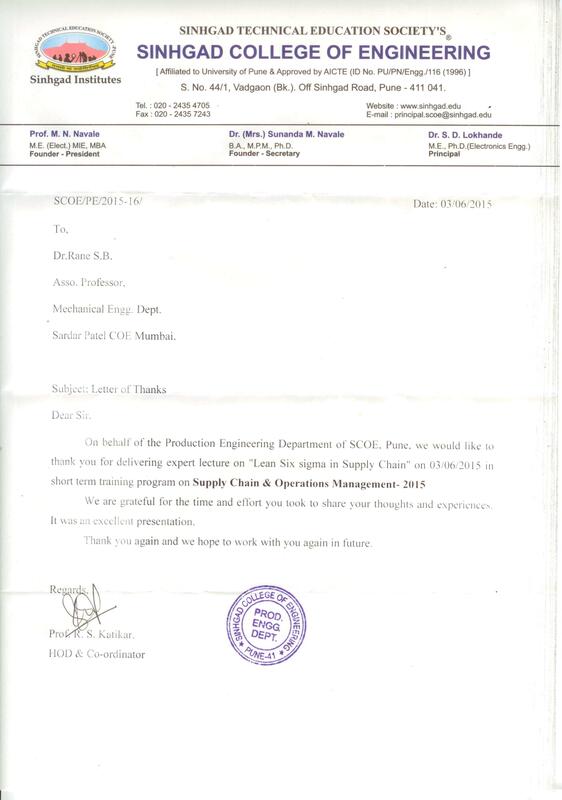 3 B.A.R.C., Mumbai Prof. Megha Janbandhu 28/02/2015 M.E.S.A. 2001 Two Stage Stirling Cycle Cryocooler development at I.I.T. Bombay, Powai. Dr. P.V.Natu acted as Joint coordinator 20 Lacs Sponsored by Department of Science & Technology. New Delhi. Dr.R.R. 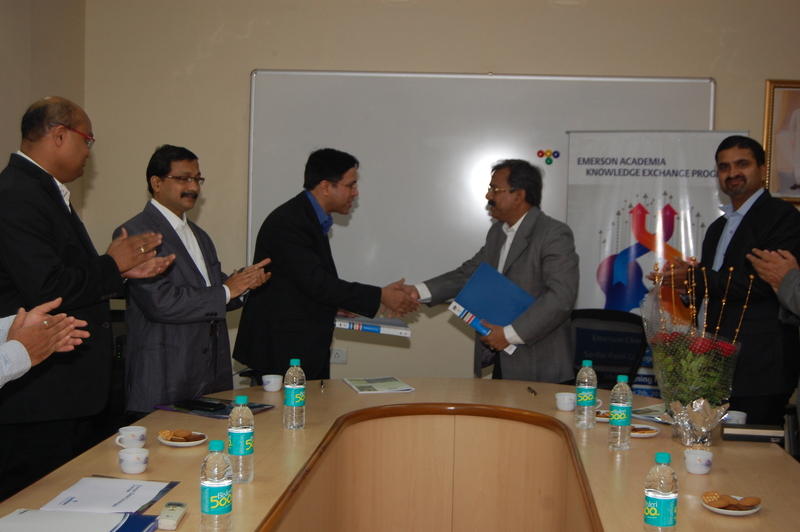 Easow along with Dr. Milind Rane and S.V. 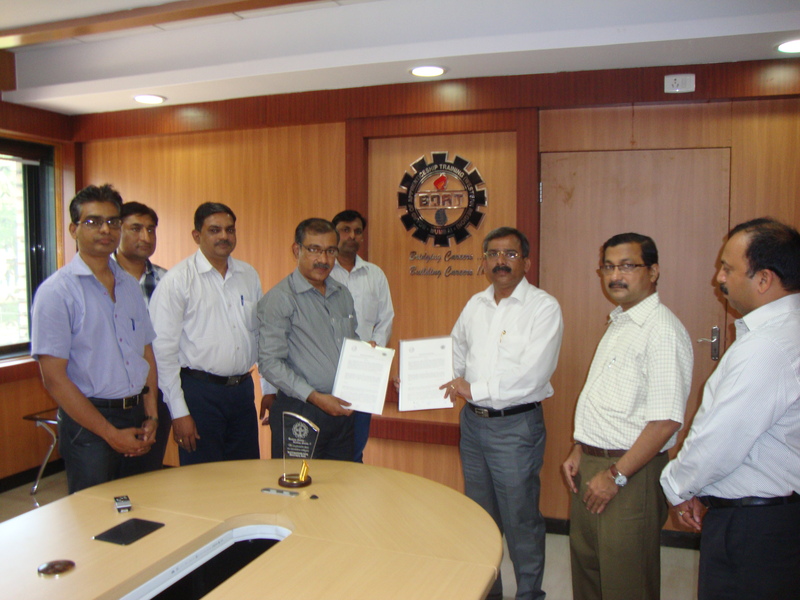 Kota Reddy filed a patent on "Process for energy efficient conditioning of air using liquid dessicant". Patent Application no. 612/MUM/2003 ON 12TH JUNE 2003. To be a Nationally recognized Mechanical Engineering Department producing a blend of responsible & competent engineering graduates with inculcation of human values in next five years. • To encourage the students to participates in extracurricular activities for overall personality development and be a responsible person of the society. Programme Educational Objectives for B.Tech. Engineering and other interdisciplinary fields. II. Graduates will become entrepreneurs, innovators & researchers to address social, technical and business challenges. III. Graduate will engage in lifelong learning such as higher studies, research and other continuous professional development activities. II. Graduates will become academicians, researchers and consultants to address social, technical and business challenges. Research Area : Fracture Mechanics,FEM, Stress Analysis. Research Area : Microfabrication, Additive Manufacturing, MEMS, Flexural Systems. Research Area : Control of separated flows, Experimental and computational aerodynamics, Low GWP refrigerants. I. An ability to apply knowledge of mathematics, science and mechanical engineering. II. An ability to identify, formulate, solve and draw appropriate conclusions of complex mechanical engineering problems. sustainability, health, safety, legal and cultural. IV. An ability to design and conduct experiments with given constraints analyse and interpret data for complex engineering problems having multiple possible solutions. VI. An ability to use the techniques, skills and modern engineering tools such as CAD, analysis and simulation tools necessary for engineering practice. VII. Responsiveness towards professionalism and ethics. IX. An ability to communicate effectively. X. An ability to demonstrate the knowledge of engineering and management principles and apply these to manage the projects and its financial aspects. XI. An ability to engage in lifelong learning. I. Extensive knowledge of Machine Design discipline with an ability to associate this learning to identify, assess, analyse and integrate new knowledge areas and contribute towards enrichment of the disciplinary knowledge. II. An ability to perform investigation of complex engineering problems by applying both analytical and creative thinking and arrive at wide range of potential solutions and further evaluate them considering public health and safety, cultural, societal and environmental factors. III. A skill to undertake research by applying appropriate research methodologies such as literature survey, design/ conduct of experiments, analysis and interpretation of data and conceptualise solutions that leads to scientific/ technological development. IV. An ability to create, apply and adapt techniques using modern engineering and IT tools for modelling and analysis of engineering systems. V. An ability to communicate effectively and to function in collaborative-multidisciplinary team activities. VI. An ability to demonstrate knowledge of engineering and management principles and apply these to manage projects and its financial aspects. VII. To continuously do independent and reflective learning in order to improve upon one’s skills and abilities and to engage in lifelong learning. VIII. 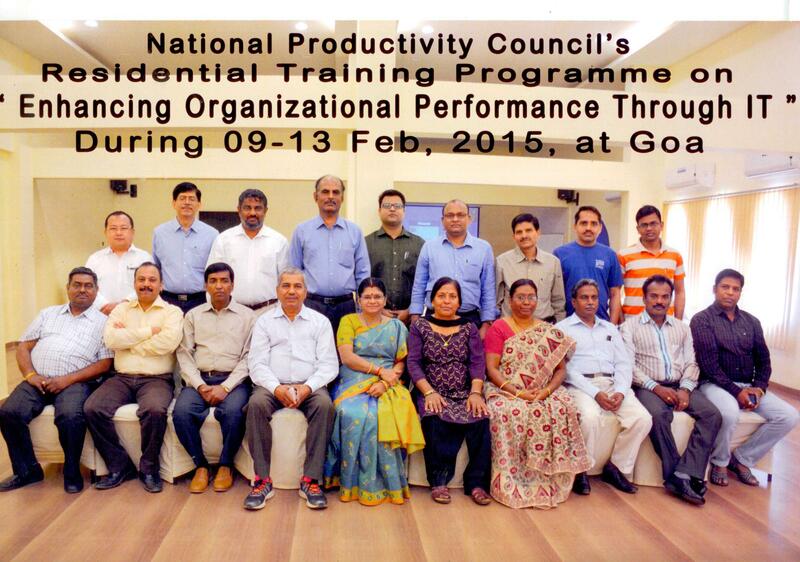 Responsiveness towards development of society, professionalism and ethics. I. Extensive knowledge of Thermal Engineering discipline with an ability to associate this learning to identify, assess, analyse and integrate new knowledge areas and contribute towards enrichment of the disciplinary knowledge. These were the points discussed during the introduction presentation given by Dr.R.B.Buktar at the beginning which the delegates found interesting and worth noting. 1. Faculty from manufacturing and production:The guests were concerned if there were any faculties who had any industrial experience of manufacturing and production. 2. 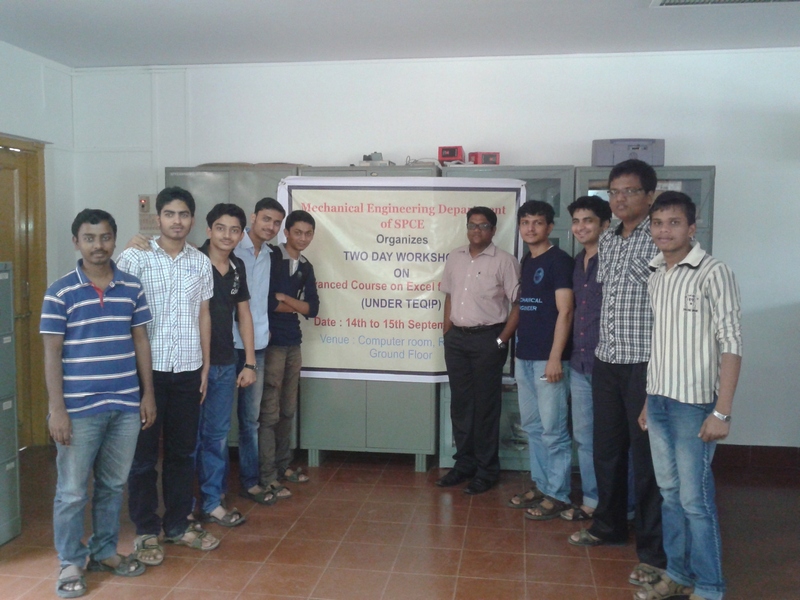 Upgradation of softwares: Engineering softwares like MATLAB, ANSYS were discussed. They were interested in knowing how many licenses of which softwares are available in the institute and if they were full or educational versions. 3. 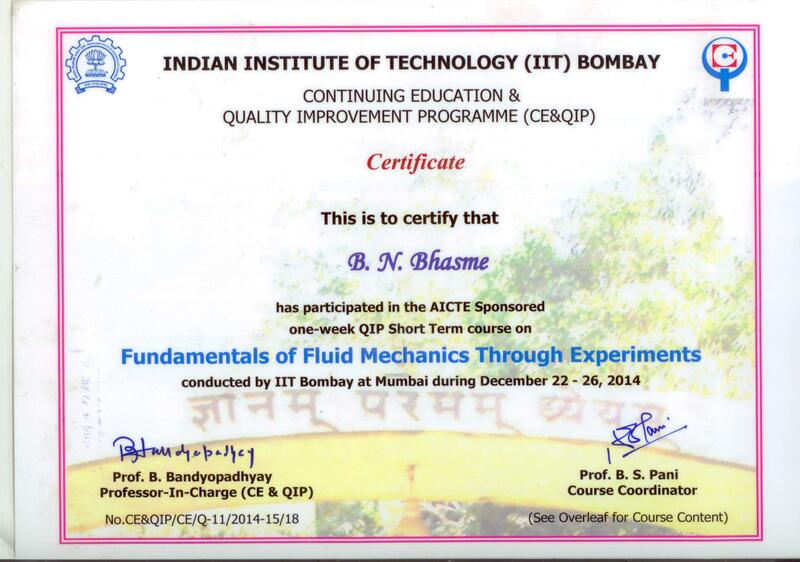 QIP: They were also eager enough in knowing what QIP (quality improvement programme) is under AICTE. 4. Programmes in QA and QC:they were concerned to know if there were any programmes in QA and QC being offered by the institution to the students. 5. Summer internships: Another point that was raised about summer internships that industries can provide to the students during their vacations. 6. Developments of new products: Industry and institute can work together to develop new products. An example of textile institute of Eichel Currengy was introduced where products were patented. 1. Employee should be ready and well prepared so as to start work from the very first day of joining. 2. There should be innovative skills in freshers i.e. at college level he or she should have strong exposure to innovations, innovative ideas etc. during the entire course of education. 3. There should be inputs from industries for student academics and academicians to develop and refine the included syllabus for curricular. 4. There should be subjects included and programs to be conducted to make students aware of what type of problems industries face in practical sense. 5. Academics and activities should get along with industries that will actually reduce the training period of student employees. 6. There should be selection criterias for practical industrial projects. 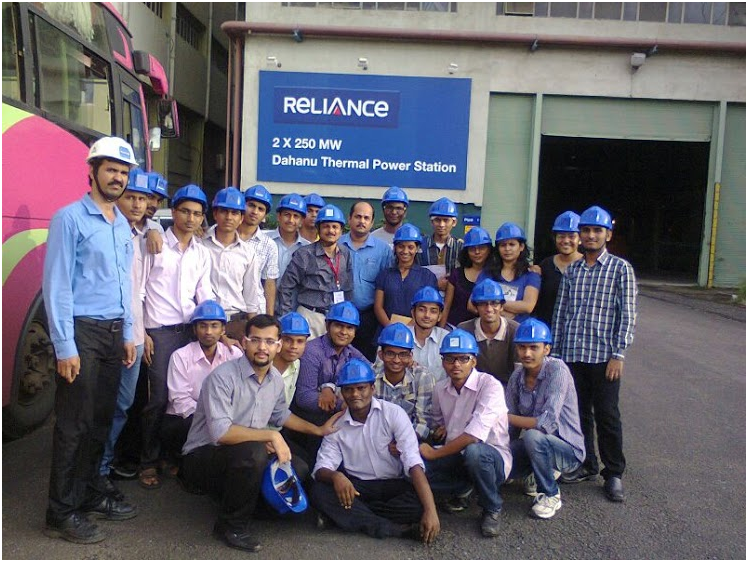 Students exposure to industrial training or project work will make them practically strong to survive and adapt in industrial environment within a short period of time. 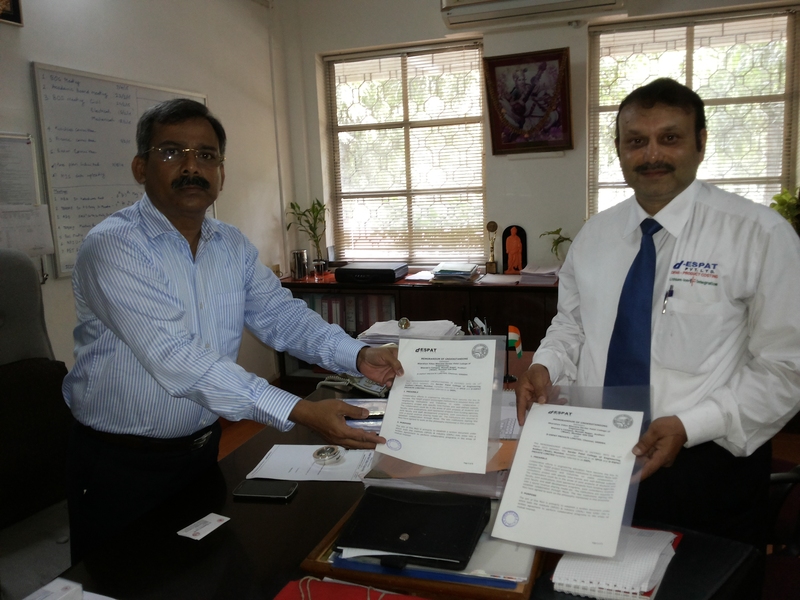 L&T has recently signed the MOU with Sardar Patel College of Engineering, they are ready for support and co-operation through this collaboration. It’s a pleasure for our college. * Graduate Engineer should be able to work from the day one and should be able to contribute from the first day. This is what the industry wants but is not delivered. So in order to make that possible, students should be given exposure to the industry and should be trained for the industry specific needs during their academics. * Innovative aptitude is expected from the students. Students are more into academics and they have poor aptitude which should be improved. * Industry can contribute for the research work. * The programmes that are offered during the vacations should not be too industry specific but should be broader so that the students can take benefits from it. * Industry should be able to select the students for the project work. There should be some criteria that can be defined to select he students based on the topic that the project will be based on. * Gave an example of industry institute collaboration (collaboration of textile institute of Ichalkaranji with fabric industry) that led to patenting of a product in textile and fabrics. So development of products can be possible also through the collaboration. * Technology Incubation Units and tailor made certificates were discussed and special interest was shown in these areas. * They are ready for the establishment of calibration lab in the college. * He was concerned about assigning thermal projects to master students because they have the fresh knowledge through their thorough study they are still the students not the industrial men. * Solar air conditioning is the latest emerging area for construction industries, let the students and their opinions involve as a part of dissertation work. * Industrial projects in simulation and CFD should be handover to students. * Certificate courses as a part of curriculum along with multiple subjects and projects will really make the students aware about industry needs. * At least some part of curricula should be introductory to marketing and marketing strategies. * Industrial marketing people meetings should be arranged with students and professors at the college level. * They are ready for providing expert industrial marketing man for training and guest lectures. 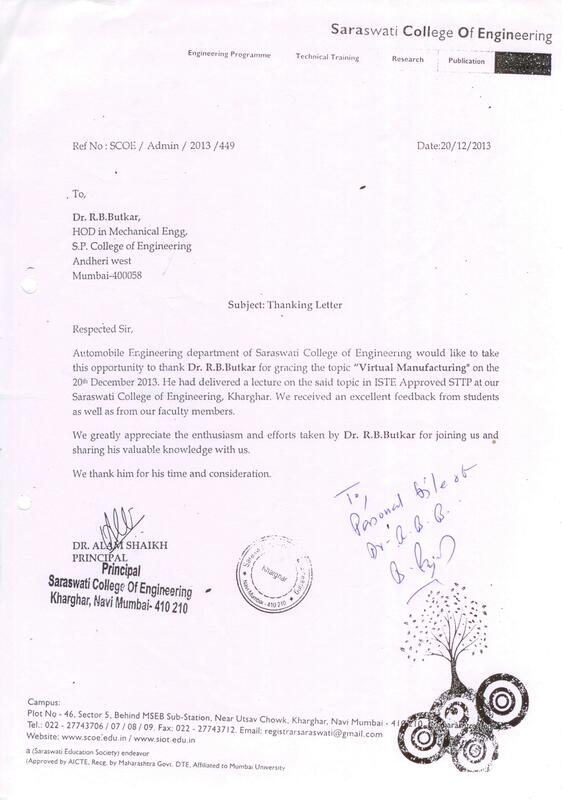 Aker solution is at the verge to sign MOU with Sardar Patel College of Engineering in coming few days in first semester of academic year 2013. 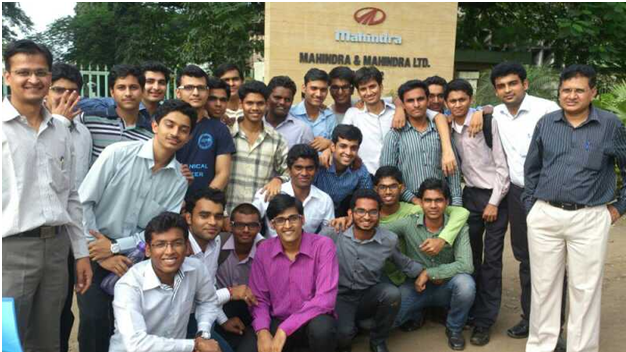 * They are going to look for student internships and projects under their vigilance in future. * He suggested to grab the policy of CSR (Corporate Social Responsibilities) for the industries and there should be exposure of Introduction to CSR and its benefits for the students during their academic sessions. * There should be training, internship and short term project plans during the academics of the students. * They are ready to provide expert speakers from their group for the guest lectures. * According to his opinions short term training programs for shop floor workers under their expert trainers and speakers should be there in college. 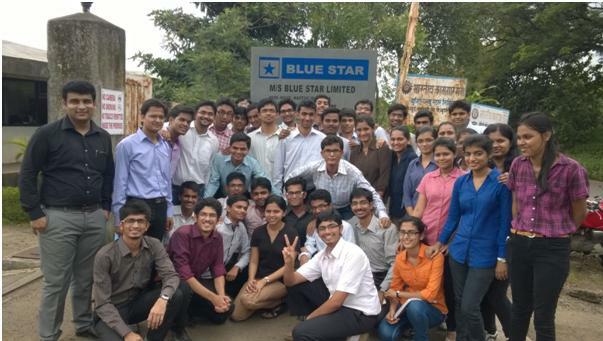 * College may be development center for shop floor skills if started in collaboration with ASM. * The will look forward our institute as a incubation center for aesthetic and painting training program because they are more concerned about skills of shop floor workers. * According to him curricular theoretical study should be there for 3 years of engineering duration and last year for complete technical exposure. * They have collaborated with different Institutes. 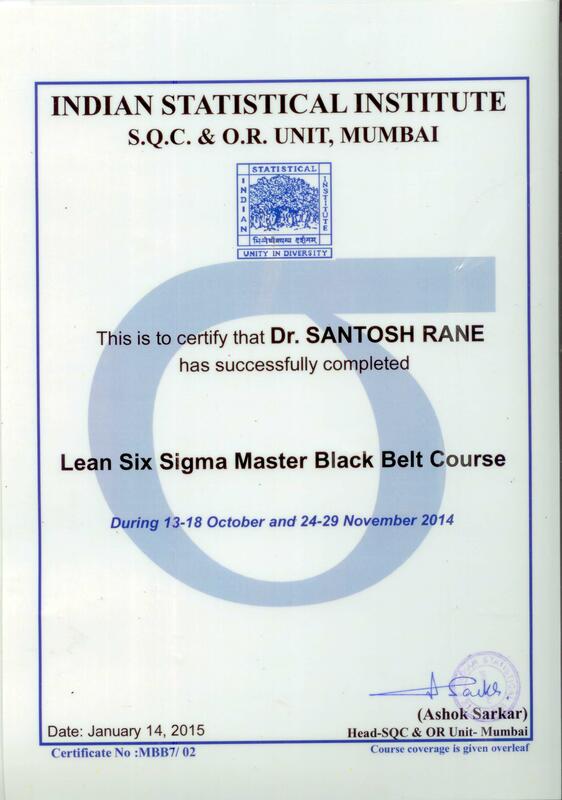 * The result of their tie up with ARAI Pune is coming with different specific courses in forging. * According to him media sources should be used for more virtuality of teaching. eg. Videos should be shown to the students during the span of lectures. * Practicals should be based on live required industrial machining and product development. * He has started M.Sc. mobile application program for Android 2.7 in Gujrat. * TCS is going to start the six month training program named “Experience the Experienced” for Non-IT students. For students convenience regular classes will be there only on weekends. * There will be number of industrial exposures during the course and before the first day of joining the class candidate will have four to five days of different industrial exposures so that he will be mentally strong and ready to grasp the conceptual learning during lectures. * If it is not so then he or she will not understand the standard path procedures, product cycle management, billing and other industrial policies during lectures and practices. * The training classes are going to be started in the major cities of India like Mumbai, Pune, Koembture, Chennai and Banglore. 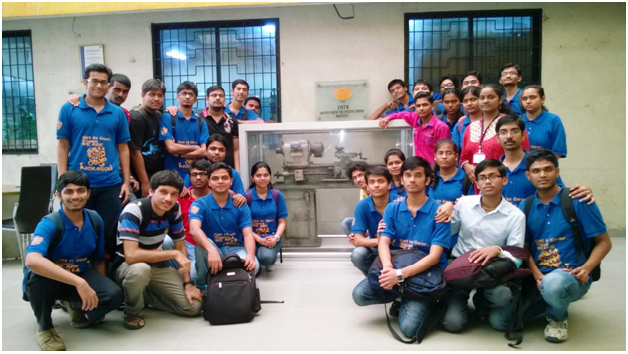 In this laboratory students are introduced to different refrigeration and air conditioning equipments, where students get actual hands on the refrigeration and air conditioning equipments. Here students learn how to measure the actual performance of the different refrigeration and air conditioning equipments. Facilities available in refrigeration and air conditioning laboratory are vapour compression refrigeration cycle test rig, mechanical heat pump, bench top cooling tower, air and water heat pump, recirculating air-conditioning unit, thermo-electric heat pump. To find the actual coefficient of performance of refrigeration cycle test rig. To find the actual coefficient of performance of mechanical heat pump. Performance on mechanical heat pump and comparing actual vapour compression cycle with theoretical on p-h chart. Studying performance of cooling tower. Determining humidifying efficiency of cooling tower. Determining the actual coefficient of performance of air and water heat pump. Demonstration of Air Conditioning processes used in air conditioning plant. 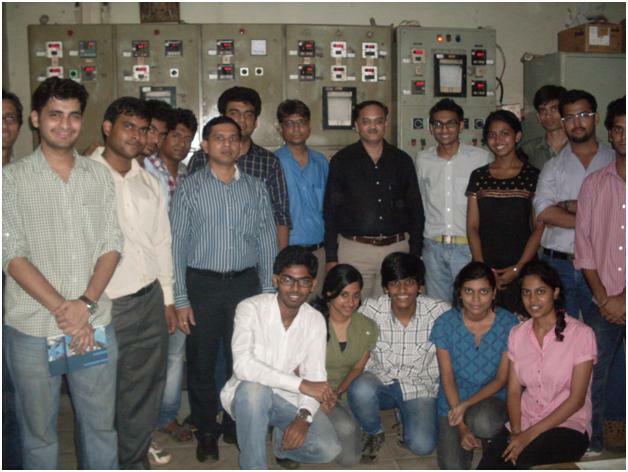 This laboratory has been developed to cater the need of UG and PG program run by mechanical engineering department. It is one of the well equipped laboratories of the department. Well developed experimental setups available in the laboratory, help students to learn and understand fundaments better through practical. Laboratory also has many experimental facility such as sensors, transducers and data acquisition system to carryout research activity at UG and PG level. Many national awards and prizes have been won by our students, who have worked here to convert their dreams into reality. To determine thermal conductivity and thermal resistance of composite wall. To determine the emissivity of grey surface. To find out heat transfer coefficient heat transfer rate from vertical cylinder in natural convection. To determine the convective heat & rate of heat transfer by forced convection for flow of air inside a horizontal pipe. To determine the heat transfer, temperature distribution and effectiveness from a pin fin for Free Convection. To determine the heat transfer, temperature distribution and effectiveness from a pin fin for Force Convection. To determine Critical flux of Water at various bulk temperature of water. To study the construction, working and application of heat pipe. Study of fuel injection system. Morse Test on petrol engine. Speed Test on petrol or/and diesel engine. Load Test on diesel engine (engines). Heat Balance test on diesel or petrol engines. Experimental determination of Air fuel ratio. Exhaust Gas/Smoke analysis of S.I. / C.I. engines. Effect of Supercharging on Performance Characteristics of an engine. The Mechanical Vibrations Systems Laboratory provides opportunities for students to study vibration analysis into the design of products. The lab serves Mechanical Vibrations which is part of curriculum . The objective of this lab is to provide students with an environment to study engineering systems for vibration analysis. This lab space is being utilized for experimental and course related projects and demonstrations. The lab also use for design projects, which involve concepts and applications in terms of dynamics, vibrations and controls. This laboratory is mainly to give a practical exposure to the students who are indeed first step of planning theory of vibrations.The student is made to physically experience basic concepts in vibration. Universal vibration testing machine available in the laboratory to perform experiments. Mechatronics is an electromechanical systems that merges mechanical, electrical, control system, and embedded software design. The department has a well-equipped Laboratory with the all equipments and infrastructure. The laboratory is equipped with pneumatic and hydraulic kits that are required for conducting the experiments as per the syllabus. 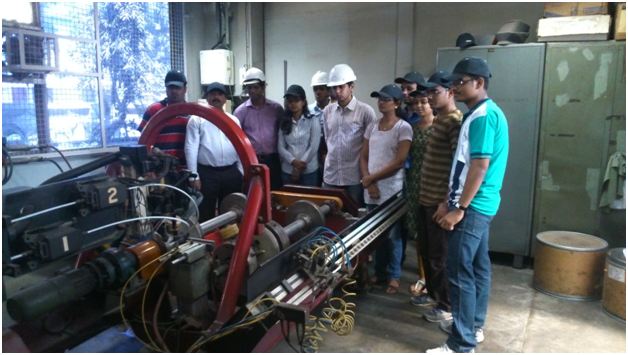 This lab provides the students with hands-on experience with some of the finest automation equipment. Experiments related to basic pneumatics, electro pneumatics. The Mechatronics lab is fully equipped with Pneumatics trainer kits. The Pneumatic kits include basic pneumatic kit, electro pneumatic and programmable controlled pneumatics. Fluid & Hydraulic simulation software is also available. This LAB. will be used by the B.Tech. Mechanical students in their practical session for the subject of CAD/CAM/CIM to manufacture parts automatically on these machine. Mech. Engg. Dept. is starting new PG course i.e. Computer Integrated Manufacturing. This Lab will be utilized in the PG program to carry out manufacturing operations on the CNC machines. Proposed to start a new Certification program on CNC Programming in collaboration with industry who is willing to collaborate. Consultancy can be started in CNC machining. There are many small industries in and around Mumbai. So we can manufacture the parts for those small scale industries to generate internal revenue. Computerised Numerically Controlled Turning Machine is a state of art facility in CNC Lab. 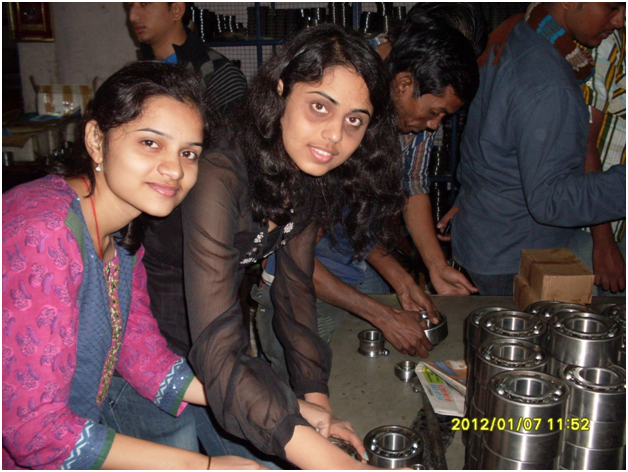 in Mechanical Engineering Department, for performing automated machining operations. Vertical Machining Centre (VMC) is a state of art facility in CNC Lab. in Mechanical Engineering Department, for performing automated Milling operations. Graduates will become entrepreneurs, innovators and researchers to address social, technical and business challenges. Graduate will engage in lifelong learning such as higher studies, research and other continuous professional development activities. An ability to apply knowledge of mathematics, science and mechanical engineering. An ability to identify, formulate, solve and draw appropriate conclusions of complex mechanical engineering problems. An ability to design and develop a system or process to meet desired needs with appropriate considerations such as economic, environmental, social, ethical, manufacturability, sustainability, health, safety, legal and cultural. An ability to design and conduct experiments with given constraints analyse and interpret data for complex engineering problems having multiple possible solutions. An ability to use the techniques, skills and modern engineering tools such as CAD, analysis and simulation tools necessary for engineering practice. Responsiveness towards professionalism and ethics. An ability to demonstrate the knowledge of engineering and management principles and apply these to manage the projects and its financial aspects. An ability to engage in lifelong learning. Prof. Parag Muley, Mechanical Engineering Department, SPCE, who is currently pursing Ph.D. at IIT Bombay, participated in the prestigious Asian School on Superconductivity and Cryogenics for Accelerators (ASSCA-2017). The school was organized by and held at the High Energy Accelerator Research Organization (KEK), Tsukuba, Japan, from 10/12/2017 to 17/12/2017. Total 39 candidates recommended by various Academic and Research Institutions of repute across the globe were selected for participation in ASSCA-2017. 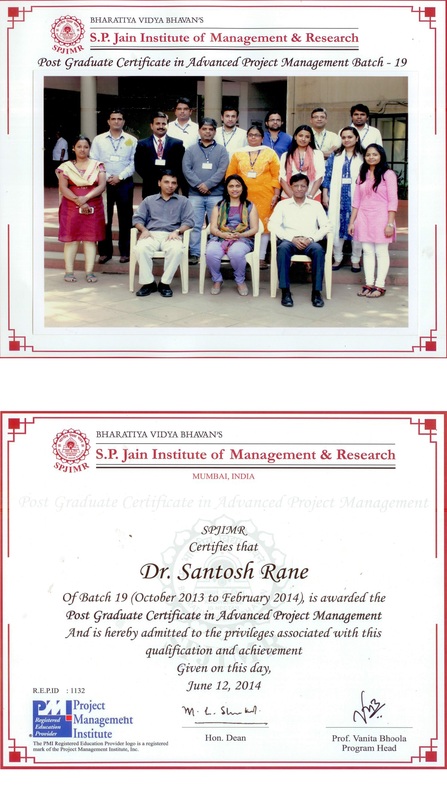 Prof.Parag Muley was recommended by IIT Bombay and has successfully completed this training program.We, the faculty, staff and students at SPCE, heartily congratulate him for his valuable achievement. 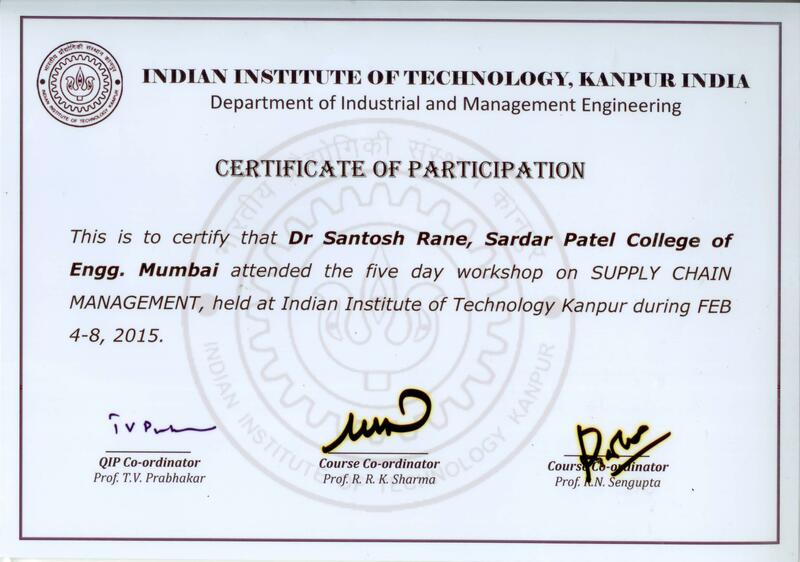 11 Hands-on training workshop on fabrication of MEMS sensor IIT Bombay 11/04/2016 To 15/04/2016 Dr. K. S. Bhole INUP project of DIT, MCIT of Govt. of India. Graduates will become academicians, researchers and consultants to address social, technical and business challenges. Extensive knowledge of Machine Design discipline with an ability to associate this learning to identify, assess, analyse and integrate new knowledge areas and contribute towards enrichment of the disciplinary knowledge. An ability to perform investigation of complex engineering problems by applying both analytical and creative thinking and arrive at wide range of potential solutions and further evaluate them considering public health and safety, cultural, societal and environmental factors. A skill to undertake research by applying appropriate research methodologies such as literature survey, design/ conduct of experiments, analysis and interpretation of data and conceptualise solutions that leads to scientific/ technological development. An ability to create, apply and adapt techniques using modern engineering and IT tools for modelling and analysis of engineering systems. An ability to communicate effectively and to function in collaborative-multidisciplinary team activities. An ability to demonstrate knowledge of engineering and management principles and apply these to manage projects and its financial aspects. To continuously do independent and reflective learning in order to improve upon one’s skills and abilities and to engage in lifelong learning. Responsiveness towards development of society, professionalism and ethics. Extensive knowledge of Thermal Engineering discipline with an ability to associate this learning to identify, assess, analyse and integrate new knowledge areas and contribute towards enrichment of the disciplinary knowledge. To establish as a Distinguished Centre of Excellence for Research in Mechanical Engineering and allied fields; to contribute significantly in service to the nation and mankind. To develop the Need based Technological Solutions to serve the mankind and nation in better fashion. To nurture responsible leaders and pioneers that will push the frontiers of knowledge, challenge the status quo and work towards betterment of the society. 1 Prediction model for Success of Business Excellence (TQM) Initiative Mishra Nandkumar Umashankar SBR Course work in progress. 2 CFD Mohammad Rafique B. Agerwale RSM Course work in progress. 3 Modelling Risk in International Projects Dandage Rahul Vishwanath SSM Course work in progress. 5 Supply Chain Management : Product Variety Perspective Mahajan Vijay B. VRK 17/9/2010 28/17-09-2010 Registration Done Ph.D.